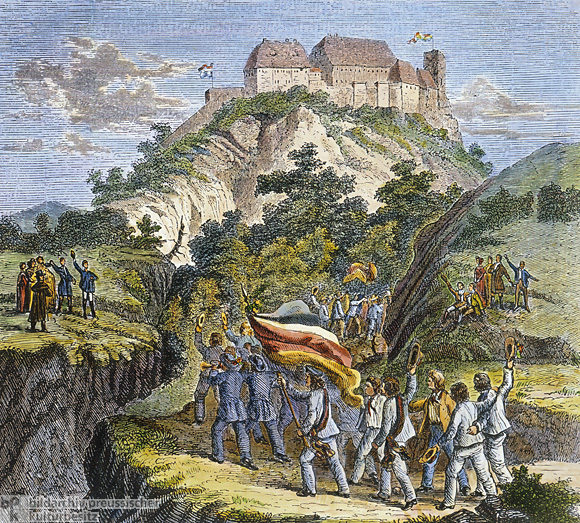 On October 18, 1817, students from various German universities met at the Wartburg castle (located near Eisenach in Thuringia) to mark the 300th anniversary of the beginning of the Reformation and the fourth anniversary of the Battle of the Nations at Leipzig. As Martin Luther’s place of refuge in 1521-22, the Wartburg was regarded as a symbol of German nationalism. The gathering, which included approximately 500 students and a number of professors, was a protest demonstration against reactionary politics and the “mini-state” system. Instead, participants favored a German nation-state with its own constitution. Among the members of Landsmannschaften [regional associations], the demand for national unity had always been particularly strong. This demand found cogent expression when the first student fraternity [Burschenschaft] was founded by Jena students in 1815. This new type of association – one that envisioned the unification of all students at a given university – replaced the old Landsmannschaften and functioned as a model for German unity. The students proceeding toward the Wartburg in the wood engraving below had come at the invitation of the Jena fraternity. The color scheme of their flags – black, red, and, gold – derived from the uniforms of the free corps regiments who had fought in the Wars of Liberation against Napoleon. During the Wartburg Festival, numerous books were burned, including the Napoleonic Code (the French Civil Code from 1804), the Geschichte des deutschen Reichs [The History of the German Reich] by August von Kotzebue, who was later murdered, and Germanomanie by the Jewish writer Saul Ascher. That the fraternities’ romanticized vision of “Germanness” contained the seeds of nationalist chauvinism was clearly recognized by Heinrich Heine, who wrote in 1840, “At the Wartburg there ruled a kind of narrow Teutonomania, which whined much about love and belief, but whose love was nothing other than the hatred of the foreign and whose belief consisted solely of irrationality, and which, in its ignorance, knew of nothing better to do than burn books.” In 1819, the government of the German Confederation took the murder of Kotzebue by Karl Sand as reason to ban fraternities under the Carlsbad Decrees, to keep a watch on universities, and to dismiss professors who encouraged liberal, “revolutionary” activities. Contemporary colored wood engraving.